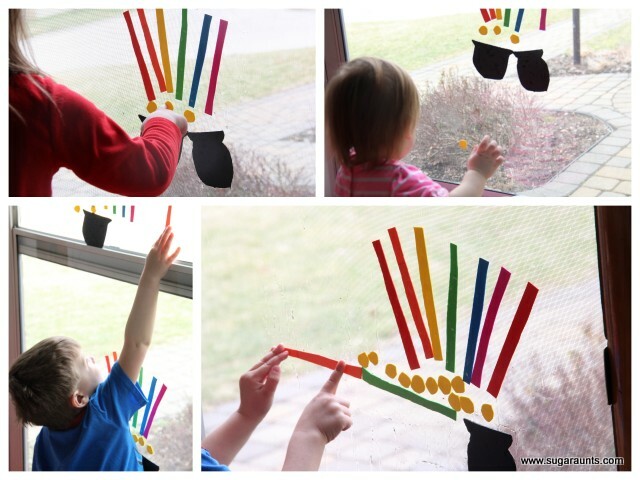 Rainbow Play: Foam sheets on the window! We have had a fun little activity going on here alllll week. We cut foam sheets into strips and gold coins. But didn't have a black foam sheet for the pot of gold. What could be used...oh, a take out container would work! Foam strips, foam gold coins, foam black pot, and a little bowl of water. Everyone had so much fun with this! They played for a looong time. And ever since, when a piece falls down, they will go into the bathroom and wet the piece under the sink and put it back up. We have been doing so many fun Rainbow play activities this week. Little Guy has a new line when we say the colors of the rainbow: "Don't forget the indigo and violet, Mom".